Marvel Feature #1 (December 1971). Art by Neal Adams. The Defenders are a loosely organized team of fictional characters mostly, but not solely, superheroes in the Marvel Universe. For much of their history, there was no official membership. 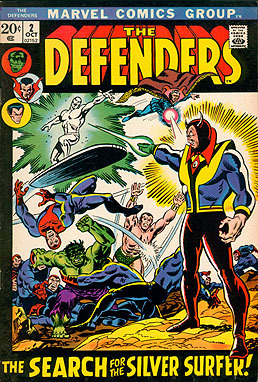 Thus, the Defenders had a reputation as being a non-team, a term which was coined in the pages of the comic. [volume & issue needed] All could be considered Defenders. The following list attempts to make sense of their membership but may not be complete. These characters helped form the team in Marvel Features #1 (December 1971). Doctor Strange Stephen Strange Marvel Feature #1 (December 1971). Clea Clea Marvel Feature #2 (March 1972). Later became a recurring member in Defenders #39. Silver Surfer Norrin Radd Defenders #2 (October 1972). Valkyrie Brunnhilde of Asgard Defenders #4 (February 1973). Created by the Enchantress as a mystical combination of the spirit of Brünnehilde the Valkyrie and the body of minor magic user Barbara-Denton Norriss; former member of the Secret Avengers. Nighthawk Kyle Richmond Defenders #14 (July 1974). Reformed member of Squadron Sinister, replaced Namor. Power Man Luke Cage Defenders #17 (November 1974). Son of Satan Daimon Hellstrom Giant-Size Defenders #2 (October 1974). Yellowjacket Hank Pym Defenders #23 (May 1975). Hellcat Patsy Walker Defenders #44 (February 1977). Devil-Slayer Eric Payne Defenders #58 (April 1978). The team had managed to keep its existence a secret from the general public until a television documentary film by supporting character Dollar Bill announced it to the world. Dollar made a special mention to the currently open membership for the team. Consequently, in Defenders #62 (August 1978), the currently active members were joined by a large number of former associates and new recruits. The majority of the latter served for a single mission before quitting in Defenders #64 (October 1978). Taking advantage of the newfound notoriety of the team, a number of supervillains formed their own rival group of so-called Defenders in Defenders #63 (September 1978). 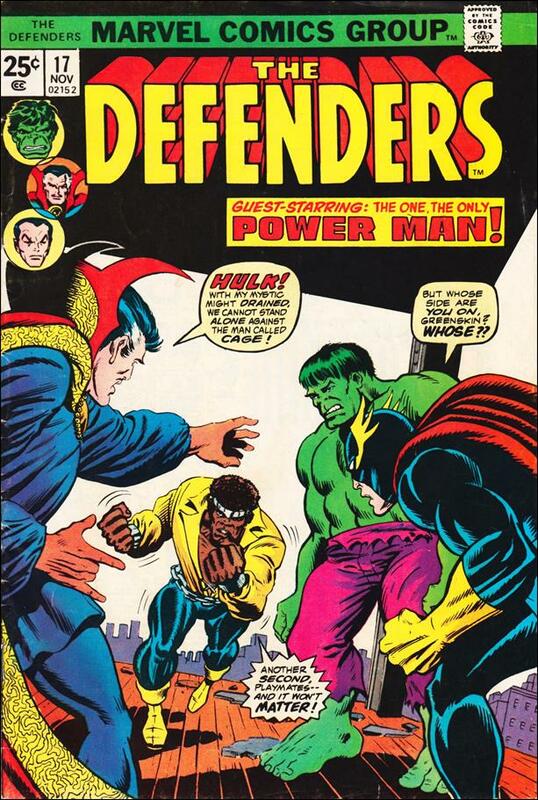 They soon came to conflict with their heroic counterparts and consequently disbanded in Defenders #64 (October 1978). Gargoyle Isaac Christians Defenders #94 (April 1981). Beast Hank McCoy Defenders #104 (February 1982). Overmind Grom Defenders #115 (January 1983). The body of Overmind under spiritual possession. In Defenders #125 (November 1983) the team was reorganized into a more formal organization, somewhat modeled after the Avengers. By this time, several former members had severed ties with the team. Angel Warren Worthington III Defenders #125 (November 1983) Later changed codename to Archangel. 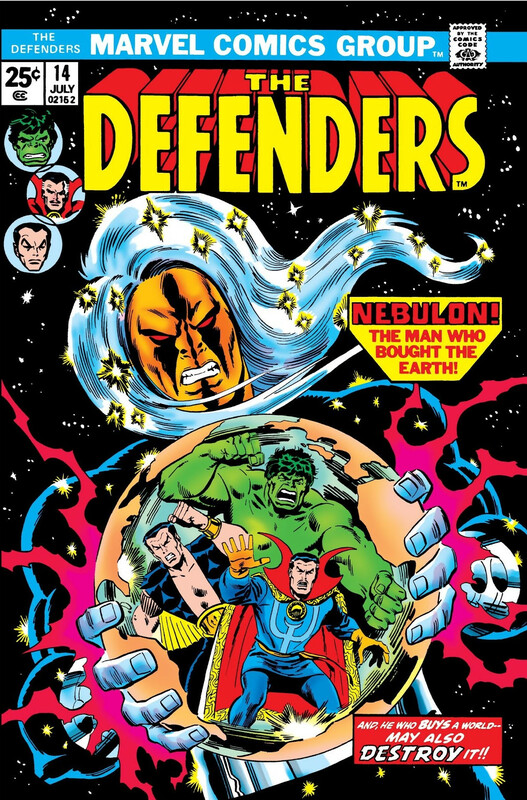 Cloud NA Defenders #127 (January 1984) A sentient nebula who was able to assume human form. At first, it modeled itself after a human female Carol Faber. After falling in love with Moondragon, Cloud also developed a male form that was modeled after Danny Milligan. Candace Southern NA Defenders #138 (December 1984). Angel's former girlfriend who is appointed leader. Deceased. Andromeda Andromeda Attumasen Defenders #147 (September 1985). Member of the Homo mermanus race. Illegitimate daughter of Attuma of Atlantis. Interloper NA Defenders #151 (January 1986). An Eternal. Man-Slaughter NA Defenders #151 (January 1986). A psychotic assassin. By the time of Defenders #152 (February 1986), Moondragon had fallen under the control of the Dragon of the Moon. The Dragon led her to attack the Defenders. During the battle, the physical forms of Andromeda, Gargoyle, Interloper, Manslaughter, Moondragon, and Valkyrie were destroyed. Candace Southern retired. Angel, Beast, and Iceman were joined by Cyclops and Marvel Girl in forming X-Factor. Gargoyle and Moondragon were later able to gain new corporeal forms. However the other four remained disembodied spirits until Doctor Strange, Sorcerer Supreme vol 3 #3–4 (March–April 1989). There they managed to gain temporary but recurring spiritual possession over the bodies of four residents of Swansea, Wales, United Kingdom. These four unknowingly acted as their representatives in forming a successor group of the Defenders. Sian Bowen: Host to the spirit of Valkyrie. Geneviene Cass: Host to the spirit of Andromeda. Will Fanshawe: Host to the spirit of Interloper. Roger Loomis: Host to the spirit of Manslaughter. Dafydd ap Iowerth: Alleged descendant of King Arthur and host to his spirit. Debuting in Dr. Strange (vol. 3) #50 (February 1993) the Secret Defenders were another successor group to the team. They were very loosely organized, consisting of a leader and the various associates recruited for a mission at hand. They would disband again after each mission. Several "members" were former Defenders. Others had no previous connection to the team. Some served for a single mission while others were recurring members. Doctor Strange Stephen Strange Dr. Strange (vol. 3) #50 (Feb. 1993) Initial leader and recruiter of the group. Spider-Man Peter Parker Fantastic Four (vol. 1) #374-375 (March–April 1993). Wolverine James "Logan" Howlett Now a member of the X-Men, the Avengers, the New Avengers, and the co-leader of X-Force. Darkhawk Chris Powell Secret Defenders #1 (Mar. 1993). Nomad Jack Monroe Served as the third Bucky during the 1950s. Later served as Scourge of the Underworld. Namorita Namorita Prentiss Secret Defenders #4 (June 1993). Captain America Steve Rogers Secret Defenders #6 (Aug. 1993). Thunderstrike Eric Masterson Secret Defenders #9 (Nov. 1993). War Machine James Rhodes Secret Defenders #9 (Nov. 1993); now a member of the Secret Avengers. Northstar Jean-Paul Beaubier Secret Defenders #11 (Jan. 1994). From Secret Defenders #12-14 (February and April), the title of characters was an organized group of super-villains that was in the quest of finding and obtaining the Oracle of Ancient Knowledge. They apparently disbanded after the successful mission. Thanos: The leader and recruiter of this group. By Secret Defenders #15 (May 1994), Doctor Strange's duties and circumstances required him elsewhere. He retired after naming Doctor Druid as his replacement. The latter would serve as leader until the group disbanded in Secret Defenders #25 (March 1995). Doctor Druid Anthony Druid Secret Defenders #15 (May 1994). The final leader and recruiter of this group. Cadaver Cody Fleischer Secret Defenders #16 (June 1994). Giant-Man Hank Pym Secret Defenders #18 (Aug. 1994). Archangel Warren Worthington III Secret Defenders #19 (Sept. 1994). U.S. Agent John Walker Secret Defenders #20 (Oct. 1994). Dagger Tandy Bowen Secret Defenders #23 (Jan. 1995). Before and during the initial few months of publication of Secret Defenders, an advertisement that Marvel used depicted a team consisting of Doctor Strange, Ghost Rider, John Blaze, Maverick, and Wolverine, a team which never existed in the comics. Neither John Blaze nor Maverick were ever part of a Secret Defenders team in any published story. In Defenders (vol. 2) #1 (March 2001), four former Defenders were forced to regroup to help Nighthawk and Hellcat in a battle against Yandroth. He was defeated but cursed them to gather every time planet Earth faces a threat. This continued until Defenders (vol. 2) #12 (February 2002). Four members of the team formed The Order. This group attempted to conquer the world in order to protect it. Its activities were featured in The Order #1-6 (April–September 2002). The group disbanded again after Gaia lifted Yandroth's curse which was associated with her. Doctor Strange Stephen Strange Defenders (vol. 2) #1 (March 2001). Became a member of The Order. Nighthawk Kyle Richmond Reformed member of Squadron Sinister. Valkyrie Samantha Parrington Defenders (vol. 2) #4 (June 2001). Transformed by the Enchantress to a duplicate of the original Valkyrie in both appearance and powers. Red Raven Unknown Defenders (vol. 2) #7 (Sept. 2001). Associate member. This incarnation of the Defenders was divided among two rival groups. The Order (Doctor Strange, the Hulk, Namor the Sub-Mariner, and the Silver Surfer) and the Defenders (Hellcat, Nighthawk, and Valkyrie). The three decided to recruit the so-called "female analogs" of their former teammates. They would serve until both teams disbanded. Clea Clea The Order #3 (June 2002). Ardina The Order #4 (July 2002). An actual female analog of Silver Surfer. It was created by combining the energy drained from him and by the magic of Clea that called the protector Goddesses Apalla (living embodiment of the Sun in Marvel Comics stories), Demeter, Hecate, Jord and Umar. Kyle Richmond requested an Initiative version of the Defenders from Tony Stark, intending to fill the ranks with previous Defenders including Gargoyle, Hellcat, and Devil Slayer. However, Stark assembled an entirely different team in hopes of the Defenders maintaining a stable roster for once. The team was officially disbanded after its first mission was deemed a failure. Blazing Skull Mark Todd Last Defenders #1. Colossus Piotr Rasputin Leaves the team in Last Defenders #2. She-Hulk Jennifer Walters Last Defenders #6: Rejoins after the Initiative version of the team disbands. After the Initiative team disbands, Richmond attempts to continue by hiring registered mercenaries to replace the teammates that Stark had assigned to him. After he was forced to retire from his superhero career, he privately assembles and supports a version of the Defenders based on an encounter with a future version of that team. This team is later forcibly disbanded by H.A.M.M.E.R. Atlas Erik Josten Last Defenders #3. Warlord Krang Krang Last Defenders #6. Nighthawk Joaquin Pennysworth Son of J.C. Pennysworth, Kyle Richmond's former business partner. Becomes a new Nighthawk in a possible future. This incarnation of the Defenders was formed during the Fear Itself storyline in order to liberate Atlantis from Attuma (in the form of Nerkodd: Breaker of Oceans). Lyra Lyra Joined in Fear Itself: The Deep #1 Now a student at the Avengers Academy. Loa Alani Ryan A student of the X-Men. The Defenders came together again when it comes to keeping the Concordance Engine from falling into the wrong hands. (November 2011) Also a member of the Heroic Age New Avengers team. Iron Fist Daniel Rand Also a former member of the Heroic Age New Avengers team. A new, street-level team calling themselves the Defenders form to stop crime. This team is based on the Netflix version of the team. Luke Cage Carl Lucas Previous member. Also a member of Heroes for Hire. "The Defenders" appear in the Marvel Cinematic Universe Netflix television series. Each of the Defenders listed below have an individual series all leading up to the miniseries Marvel's The Defenders. Daredevil Matt Murdock Charlie Cox Daredevil Season 1, Episode 1: "Into the Ring"
Jessica Jones N/A Krysten Ritter Jessica Jones Season 1, Episode 1: "AKA Ladies Night"
Luke Cage Carl Lucas Mike Colter Jessica Jones Season 1, Episode 1: "AKA Ladies Night"
Iron Fist Danny Rand Finn Jones Iron Fist Season 1, Episode 1: "Snow Gives Way"
^ "Dragon Circle". Marvunapp.com. Retrieved 2010-11-14. ^ "Dafydd ap Iowerth". Marvunapp.com. Retrieved 2010-11-14. This page was last edited on 10 April 2019, at 02:42 (UTC).